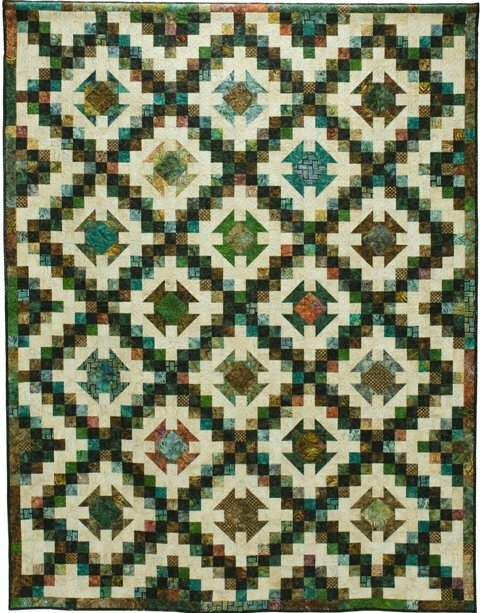 This fun Irish Chain variation pattern offers quilts in 2 sizes - 72" x 93" and 93" x 114". The pattern calls for 18 Assorted Prints for the small quilt or 16 Assorted Prints for the large quilt. Choose prints that vary somewhat value. A range from medium to dark would work well. This quilt also uses an Accent fabric that runs throughout the quilt and should show up well against your Assorted Prints. You'll also need a Background fabric. Be sure all of your "Assorted Prints" show up well against the Background. We suggest that you avoid stripes and strong directional prints for your background fabric.